This script lets you create your barcodes without leaving InDesign. No special fonts are required. 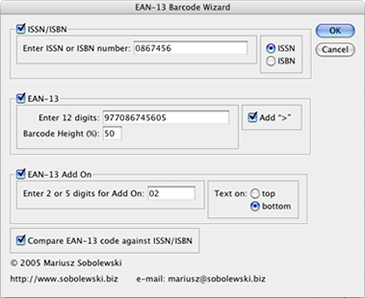 Besides EAN-13 barcodes, the script supports ISSN/ISBN (including the new 13-digit ISBN), and 2 and 5-digit EAN-13 Add Ons. A set of 2 scripts for creating simple vertical (ColumnGraph.js) and horizontal (BarGraph.js) bar graphs directly in InDesign. Unzip the files and place them in your InDesign scripts directory. Create a template for your InDesign bar/column graphs in InDesign or just draw some rectangle bars. Expand graph bars to the maximum length allowed in your graph (max. value on your graph scale). Select all the bars from top to bottom or from left to right as appropriate and double-click graph script name (BarGraph.js / ColumnGraph.js). Enter the maximum value on your graph scale and the values for each of the bars. The script will adjust the length of each bar as necessary. Enjoy! This script will let you create pie graphs directly in InDesign. Place the script in your InDesign scripts directory. Create a template for your InDesign pie graphs in InDesign or just draw a circle and select it. Click the name of the script, enter requested information and — voilà — your circle is split into slices according to the values you provided (clockwise starting on hour 12:00). Graph values need to be percentages. The script will also add and apply new swatches for each of your slices. By default all swatches are set to C25M25Y25K25, but once you change them in your document, your preference will be respected for future graphs. Enjoy!